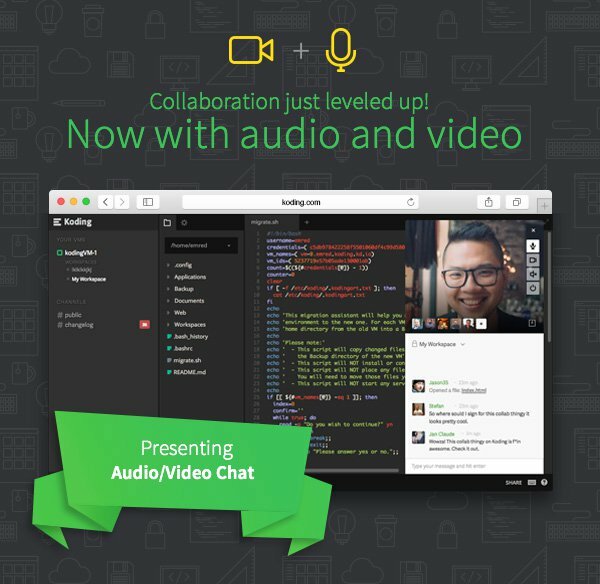 Collaboration on Koding just leveled up; Introducing Video! When launched, the current version of Koding clearly had a strong emphasis on teamwork. Our collaboration capabilities, which allowed you to easily share (in real-time) your IDE, Terminal and drawing board, made it really easy to pair-program, have technical architecture discussions, interview candidates, debug issues, teach and deliver training. You could also easily engage in dialogue over public or private chat. However, despite its advanced features, collaboration was missing one critical component… the ability to see and talk with the person you were working with. Today, with the release of the next generation of our online development platform, we fill that gap and rewrite the online IDE collaboration rules by bringing you live audio and video collaboration! Hear and see all collaborators while you work on the same code. Deliver training sessions easily without having to switch between chat and the online IDE. When two minds are not enough, invite multiple people to join in on the fun. Enjoy video and audio without installing clunky plugins or any other software. Empower your support organization to deliver even better customer success by using Koding for live troubleshooting customer issues. Use Koding to make learning more affordable and accessible. A Koding University guide that explains this feature in detail can be found here. We’ve built this next generation collaboration on top of WebRTC standards which means you get to enjoy high-speed video and audio without having to install anything! All you need is a camera-equipped computer (including Chromebooks) and you’re on your way! You can now run Kong with a click - not by reading Instructions! Koding is proud to announce our first commercial integration of our Software Evaluation Service with Mashape’s Kong product. Koding’s “Try on Koding” button is now available on Kong’s installation page here. The button allows anyone who wishes to try out Kong to skip complex installation and configuration instructions, and directly launch a running virtual machine with Kong already installed right in their browser. This process saves developers hours of time and increases sales conversions for Mashape. Today, Koding is proud to announce a new partnership with GitLab to bring revolutionary capabilities to GitLab development lifecycle. Both Koding and GitLab are passionate about making the development process simpler and easier for developers. The combination of GitLab and Koding provides the most integrated development platform in the world by combining source repository, issue tracking, continuous integration and deployment, along with a revolutionary cloud development environment which provides the ability to build every project, merge request, and issue with one click. Goodbye Koding Solo, Welcome Koding for Teams! We are stoked to announce that today Koding for teams will just be Koding. We couldn’t be more excited about the new platform; it has the best of Koding that you already know, and includes amazing new team-centric improvements that you’ve been asking for.